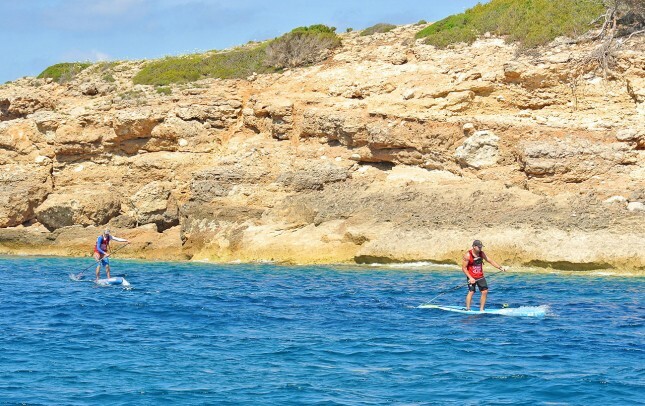 Travis Grant and Sonni Hönscheid have drawn first blood in the battle for Europe, winning the Port Adriano SUP Race on the idyllic Mediterranean island of Mallorca today. 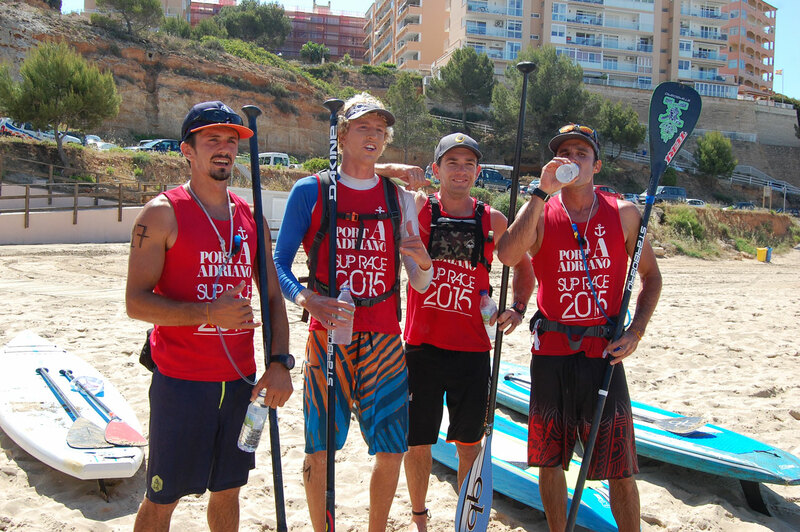 Week 1 of the 2015 Euro Tour provided paddlers with a very challenging but also very entertaining 13km course. The race started in the luxury marina of Port Adriano, before heading out into the ocean where competitors were met with a tricky mix of headwind, sidewind and downwind conditions. From there, paddlers rounded two distant islands (aka the world’s largest buoy turns) and took in some awesome scenery along the way before heading back into the harbour for the finish. After a fast start in the marina, where paddlers were flanked by $50 million super yachts, the field almost instantly scattered in the bumpy open ocean. Travis was kept in check over the first 4kms by Connor Baxter and his Starboard team mates Titouan Puyo and Leonard Nika, while Mexico’s Bicho Jimenez was never far behind. However at the mid-point, with conditions particularly difficult (sidewind), the Aussie pulled out the world-beating form that delivered him the Carolina Cup, gapping the other contenders by a good 100 metres or so. 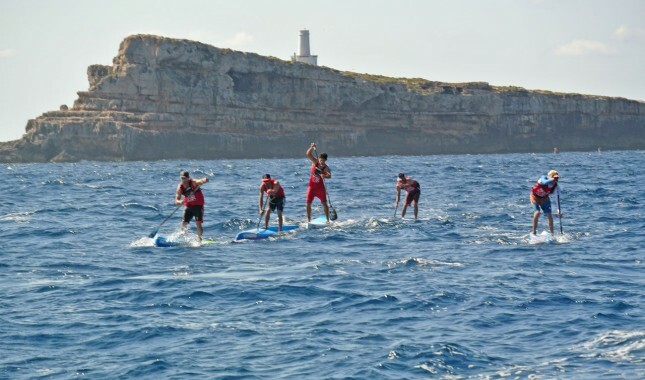 With Travis paddling away, Titou, Leo, Bicho and Connor worked together to try and minimise the damage until they could hit the safer flat water sections and eventually on to the final downwind leg home. As he rounded the second of the two islands that created a giant, figure-eight style course, Travis still had a good 30 second lead over the next four guys. From there, the race became a 2km downwinder, with the Aussie having a slight head start on his rivals. At the start of this final downwind leg back to the harbour – sweet relief after 8-10kms of messy conditions – Travis hit his stride and started surfing clear in the bumps. Only Connor could stay within shouting distance of the world number four, and actually started gaining ground towards the end of the downwinder. Connor, who just like Titou and Leo, was paddling a flat water board in anything but flat conditions, pushed Travis right to the line, closing much of the 100m gap and at one point looking set to make an incredible comeback victory. But as they entered the flat water harbour for the final, 500m sprint to the line, the Maui superstar fell just short. Travis powered home to take the win, and gain an early lead on the Euro Tour Leaderboard. The photo above highlights just how much ground Connor made up in the closing stages. This was at the end of the downwinder, with about 500m left to go. Ironically, despite Travis being on a more downwind friendly board and Connor on a flat water machine, it was Trav who powered home in the flat sprint to the line after Connor had gone quicker in the bumps. It was that kind of race. “I actually thought it was fun out there! It was bumpy and rough, backwash, sidewash and all sorts of wash. The water was very confused today. But it made for some fun, leg-burning technical ocean racing. I definitely had the right board on the right day and stoked to come out with a win. At the mid point I worked hard to put a gap on the other guys. Wanted to make sure I had a lead heading into that final downwind leg home. I know Connor is a freak in the bumps so I didn’t want to go head-to-head with him. 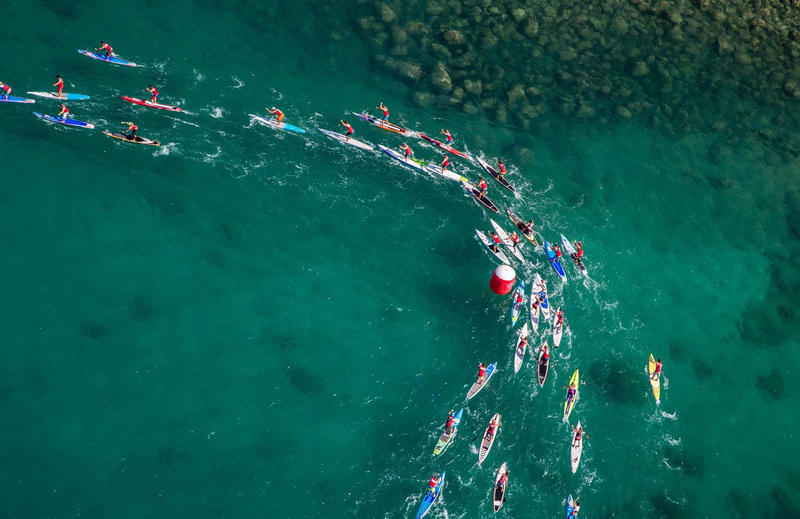 I got a few good runners at the start of the downwinder – which was an awesome way to finish the course I gotta say – and just managed to hold him off towards the end. Hear more from Travis with this great little interview via TotalSUP. 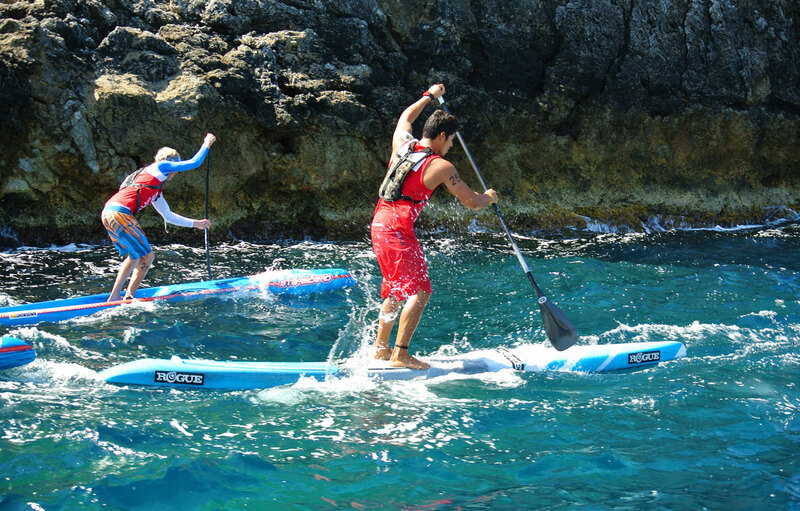 Connor, along with Leo and Titou, were paddling the 14×23 Starboard Sprint, an exceptional board in flat water but not much of a choppy open ocean machine (though in fairness, Travis was on a 23 inch wide board as well). 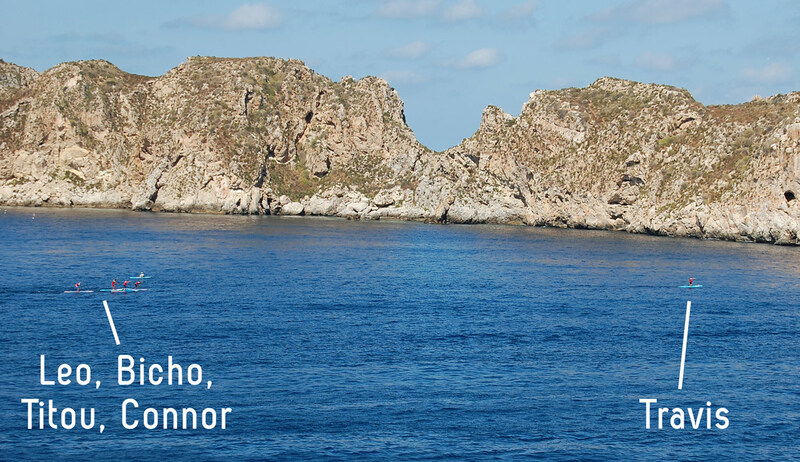 “Rounding the final island and starting the downwind leg, I knew I had to push really hard to have any chance of beating Travis. I made up some ground but fell just a little short at the finish. Behind the battle for first place, Titouan paddled clear of Leo and Bicho to round out the podium. Meanwhile, outside the Top 5 we saw an interesting sub-plot developing, with the Italian crew filling many of the Top 10 places. Apart from Leo Nika claiming 4th, a very impressive Paolo Marconi from the Jimmy Lewis team was 6th, while Fanatic boys Davide Codotto and Davide Ionico came home 8th and 9th (Mexico’s Fernando Stalla took 7th). 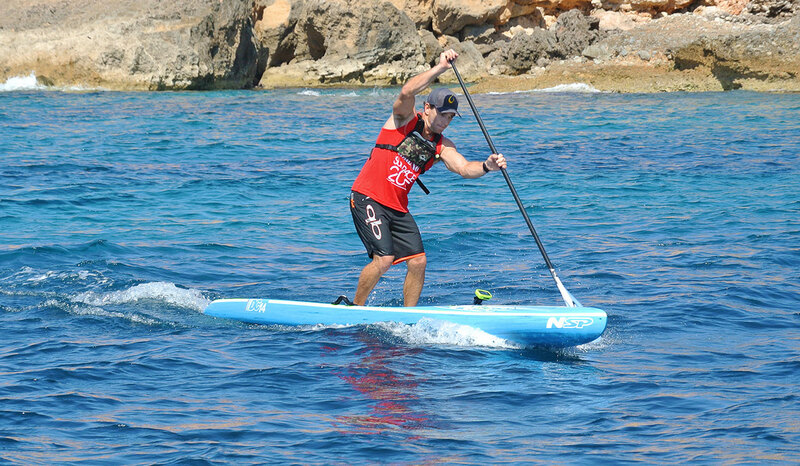 Those results give Italy four of the Top 10 spots and show they’re an emerging force on the European SUP scene. As a bonus, Team Italy came home runner-up in the women’s race. Speaking of the women’s race, we probably all knew that Sonni Honscheid was going to be in a league of her own today, and she didn’t disappoint. Her fellow Top 10 world ranked women don’t arrive in Europe until Week 2 or 3, which meant this was always a battle for second among the up-and-coming Euro girls. Though to her credit, Sonni didn’t hold back and actually crossed the line in 12th place overall, beating home the majority of the guys. Behind the powerful German it was a close battle for the runner-up spot, with emerging talent Susak Molinero taking it in a sprint to the line with another name to watch, Ane Zulaika. Shelby Taylor, fresh off the plane from Mexico, and Susanne Lier rounded out the women’s Top 5. Many paddlers lamented their choice of boards today, with a few even retiring after they struggled in the early washing machine-like conditions. But those who stayed on were rewarded with a great downwind run home, as well as some of the best coastline you could possibly imagine for a SUP race. The day finished with one of the real highlights: The kids races. The grommies are renowned for getting the biggest cheers at any SUP race, and today was no exception. 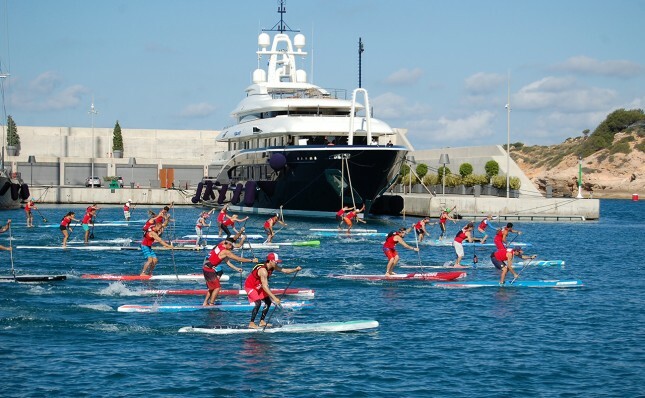 With Port Adriano being home to one of the largest junior training clubs in Europe, the kids races very nearly eclipsed the Elite Race in terms of participation numbers. Over 30 “niños y niñas” (boys & girls) hit the water for a series of intense sprint races. The kids showed not only an inspiring amount of spirit and enthusiasm, but also a very promising dose of skill and talent. Despite most of them still being around 10-12 years old (I believe ages ranged from 5 to 17), there were plenty of impressive buoy turns and smooth techniques on show. It’s a great sign for the future of the sport here in Mallorca and across Europe in general. 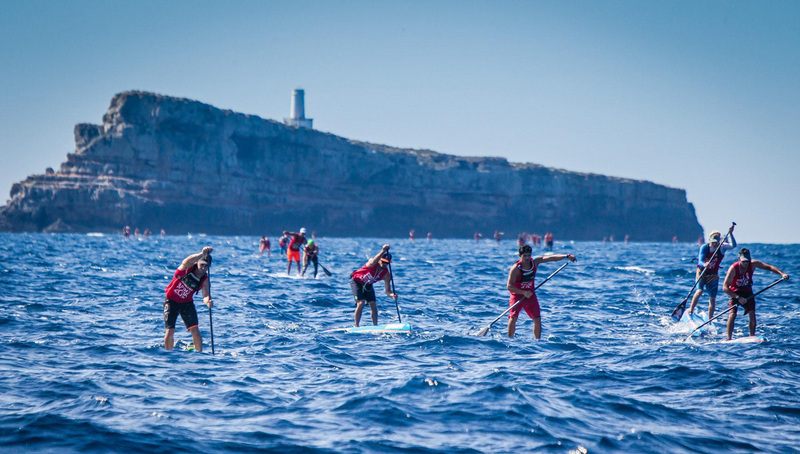 The location of the Port Adriano SUP Race is amazing. The scenery absolutely stunning and the event very well organised (where else would you get tapas at the race briefing?). The weather was perfect: Blue skies and sunshine but with a cooling breeze. 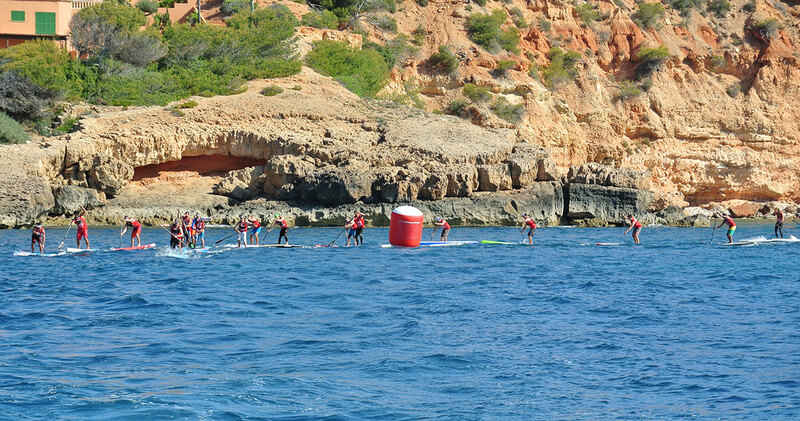 Over 100 competitors raced across the elite, amateur and kids divisions, with every paddler very well looked after. Big thanks to Port Adriano and the Mar Balear SUP Center for hosting us! We’ll have the updated Euro Tour Leaderboard and SUP Racer World Rankings shortly. In the meantime here are the times from the distance race. You can also find more pics later today on the official Euro Tour Facebook page. 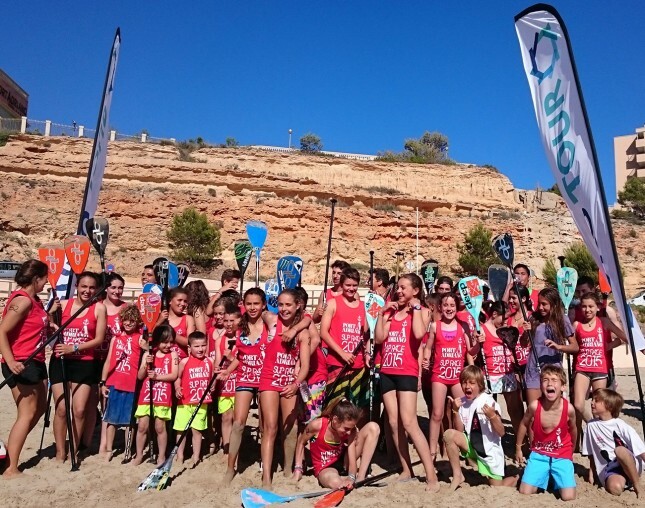 Around three dozen stoked out groms that were all winners because they all raced with spirit, enthusiasm and determination. Total carnage. I think Travis Grant won ahead of Titou and Fernando. Check out this little clip of the chaos. Crazy super fun way to finish the weekend!